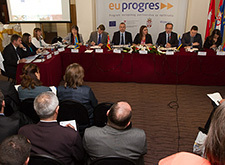 Employment of 300 people, creation of a basis for generating additional 3,000 new jobs in the next five years and helping to attract investments of at least 30 million Euros in South and South West Serbia are just some of the key results that the European Partnership with Municipalities Programme EU PROGRES accomplished in the four years by implementing 255 projects with financial support from the European Union, Government of Switzerland, Government of Serbia and 25 local governments taking part in the implementation. 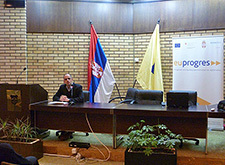 Head of the Delegation of the European Union to the Republic of Serbia, Michael Davenport, handed over the equipment for the outpatient maternity ward in Preševo that was procured with the funds from the European Union and the Government of Switzerland through the European Partnership with Municipalities Programme EU PROGRES. In the view of the citizens of 34 municipalities in South and South West Serbia, the economic growth of this part of the country should in the future be based on the development of agriculture, cattle-breeding, tourism and of the hospitality and light industries. They also think that most of the money in the local budgets should be spent on assisting farmers, building and repairing roads, developing water and sewage pipelines, helping small- and medium-sized enterprises and improving the health care system. These are some of the results of a Citizens Satisfaction Survey conducted in the 34 South and South West Serbian municipalities by the Centre for Free Elections and Democracy (CeSID), with the financial support of the European Union and the Government of Switzerland through the European Partnership with Municipalities Programme EU PROGRES.